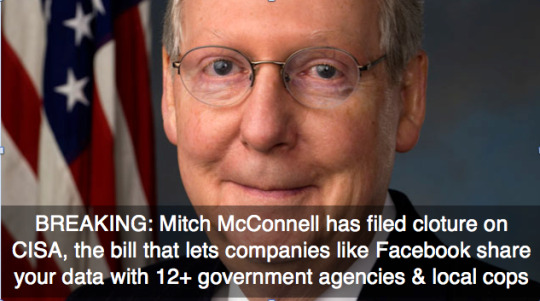 Deadline TONIGHT: Click here to take urgent action to stop CISA. But we need more than 40 Senators to vote “NO” in the next 24 hours or we will almost definitely lose. Time is everything. We simply can’t waste this opportunity to stop CISA or we will regret it for years to come. Click here to tell Congress that CISA won’t stop cyber attacks. They need to hear from you TODAY. I don’t want my kid to grow up in a world without privacy, because a world without privacy is a world without freedom of thought, a world without progress. Please join me in taking action today. We’ve made it easy: just click here to contact your lawmakers. P.S. Remember when we flew a 30 foot blimp over all of Ron Wyden’s town hall meetings to protest his terrible position on the TPP? Well we’re still mad about his corrupted position on that issue, but we’re pragmatic enough to say that EVERYONE should read his op-ed in The Guardian about how CISA means that 12+ government agencies and even local cops could have access to all your private internet data, your medical records, and more. It’s one of the clearest explanations of how this bill works that I’ve read.